The federal government offers an adoption tax credit (not a deduction) for “qualifying” adoption expenses associated with domestic and international adoptions (but not stepparent adoptions). Qualifying adoption expenses are "reasonable and necessary expenses paid in connection with, and for the principal purpose of, legally adopting an eligible child." Qualified adoption expenses include court costs, attorney fees, traveling expenses (including amounts spent for meals and lodging while away from home), and other expenses directly related to the adoption. 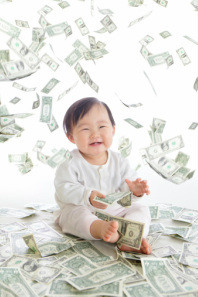 Qualified adoption expenses do not include expenses for a surrogate parenting arrangement, that violate federal or state law, that are paid using funds received from a local, state, or federal, program, are paid or reimbursed by your employer or other third party, or are allowed as a credit or deduction on a federal tax return. In 2018, the adoption tax credit is $13,810. If your annual, adjusted gross income is less than $207, 140, you will be entitled to receive the full tax credit as a dollar for dollar offset against your annual tax liability. If your gross income exceeds that amount, the amount of the credit you will be entitled to receive will be reduced and eventually phased out as your adjusted gross income approaches $247,140 This credit, however, is not refundable, which means that you will only be able to receive an offset up to the amount of the taxes due. For example, if you do not owe any federal income taxes, you will not receive a refund for the amount of the credit you were eligible to receive. And if you owe less than the amount of the adoption credit you could receive, the credit will be applied to reduce the amount of taxes due to $0, but you will be unable to receive a refund check for the difference. Any unused credit, however, can be carried forward so that you may be able to use it to reduce future tax liability. For example, if your adoption expenses are $10,000 and you only owe $8,000 in federal taxes in 2018, the maximum adoption credit you may take that year is $8,000; however, you may be able to reduce your tax liability in 2019 by the remaining difference of $2,000. And if you owe more in federal taxes than the total amount of your qualified adoption expenses, you will be able to take the full credit fox the 2018 tax year. Even if you have a failed, domestic adoption involving a child from the United States, you may still be able to claim the credit. If you adopt a child from the United States with special needs, upon finalization of the adoption, you may qualify for the full amount of the Adoption Credit even if you paid little or no adoption-related expenses. Qualified adoption expenses in connection with an international adoption (where the child was not a U.S. citizen or resident when the adoption process began) can be claimed only upon finalization of the adoption. To be eligible for the credit, the adoption must involve a child under the age of 18, or an individual of any age, who is physically or mentally incapable of caring for him or herself. The adoption credit is claimed on Form 8839, Qualified Adoption Expenses and you can e-file Form 8839. You must use Form 1040, rather than Form 1040A or 1040EZ, when claiming the Adoption Credit. Refer to Instructions for Form 8839 Qualified Adoption Expenses and chart for additional information. You do not need to submit receipts or other documentation at the time of filing; however, the IRS may request such information at a later time; therefore, it is important to keep documents verifying all adoption-related expenses. For more information on the adoption tax credit, visit the IRS web site at https://www.irs.gov/taxtopics/tc607.html. Some states also offer a tax credit that is similar to the federal credit. Contact Sheri or your local tax consultant to determine if you reside in a state that offers an adoption tax credit. In addition to the federal tax credit, many employers offer adoption benefits, including paid leave and reimbursement of adoption expenses. Check with your employer to determine the availability of adoption benefits and to determine your eligibility. It is important to note that you may be able to exclude from your taxable income the amounts your employer paid. The maximum exclusion for employer-provided adoption assistance is $12,970 for tax year 2013. If your employer pays or reimburses a particular expense, however, you may not claim those same expense for the adoption tax credit. Adoption grants are another option available to assist with reducing the high costs of adoption. Some organizations and adoption agencies offer grants and/or low-interest loans to families who inquire and qualify for their program. Typically, grant programs are for specific children (such as special needs, sibling groups, or older children), countries, or other criteria specified by the organization offering the grant. Adoption subsidies offer another way to make your adoption more affordable. Federal money as well as local subsidies may be available for certain eligible children with special needs, which does not always include a physical, mental, or social limitation. Special needs may include children of certain races or ethnic backgrounds, sibling groups, or even older children. For more information on adoption subsidies, including state-specific information, see the North American Council on Adoptable Children's website. If you are pursuing a private agency adoption, many agencies use a sliding scale to determine the cost of an adoption. The agency fee is based on your income and financial situation. Also, some agencies have programs to adopt older children that are considerably less expensive than infant adoption programs. Finally, savings, mortgage-based, home equity, and credit card loans, as well as loans and gifts from family and friends, are some of the typical methods used to finance the costs of an adoption. Some families even plan fundraisers to raise funds for their adoption. In an effort to make your adoption dream a reality and more affordable, please contact us today for more information. We are ready to assist you in exploring all of these options. Proudly serving adoptive parents throughout Maryland since 2008, including Baltimore, Carroll, Frederick, Howard, Montgomery, and Washington Counties.